Inside: Need a nap? How about a nappuccino? Sounds crazy, but medical science backs up this crazy pairing of caffeine and napping. Coffee and napping are not two words I’d usually put together in a sentence. That is until I heard about a nappuccino. Next time you’re having trouble staying awake, give this a try. Tip: If you are tossing and turning at night and just can’t get quality sleep, check out the top five sleep tools I recommend (don’t worry – they are all crazy inexpensive and don’t require an Rx ) at the bottom of this post! 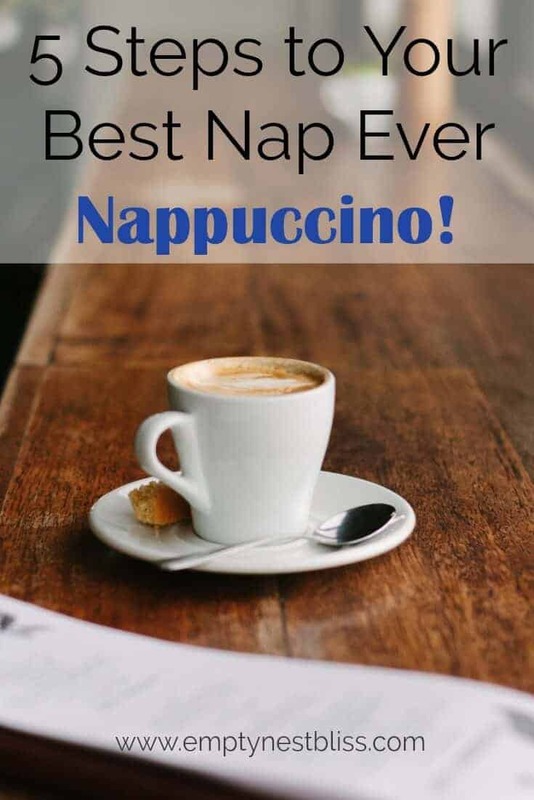 A napuccino, or coffee nap, is pretty much what it sounds like. When you’re feeling like you need a nap, you quickly drink a cup of coffee, close your eyes for 25 minutes, and awake feeling refreshed and energized. There actually is scientific evidence that it works. Adenosine is a naturally occurring chemical that builds up in your brain to make you feel sleepy. The caffeine and the short nap work together to clear adenosine from your system. One caveat: you need to be sleepy enough to want to nap for this to work. Also, the short 25-minute nap is key. Since it takes approximately 20 minutes for the caffeine to get into your bloodstream, you’ll be able to grab a quick 25-minute nap and wake up just as the stimulant effects of the coffee kick in. Find a quiet place that you won’t be disturbed. Set your alarm for 25 minutes. Wake up refreshed, rested, and clear-headed. Still tired? Grab my free list of five crazy-inexpensive sleep tools. Nappuccinos work well when you are sleepy and need to keep going. We probably aren’t pulling all-nighters anymore, but there are some nights when I just can’t seem to get quality sleep. Maybe you’re traveling and just need to recharge for the next leg of your journey. Nappuccinos can be perfect when you’re jetlagged and need to get back to the local schedule. Have you ever tried a nappuccino? Want to Remember This? 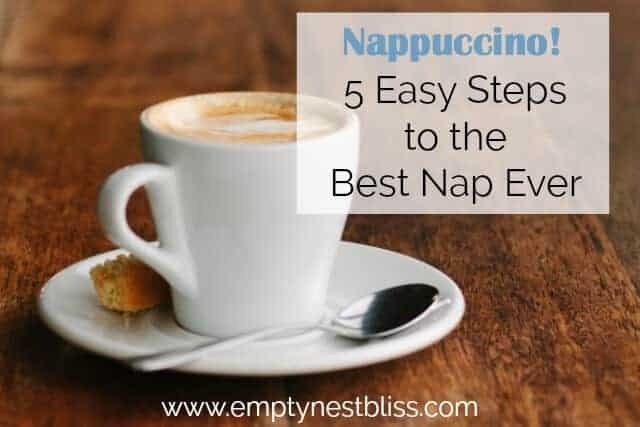 Save the 5 Easy Steps the Best Nap Ever – Nappuccino to your favorite Pinterest Board!